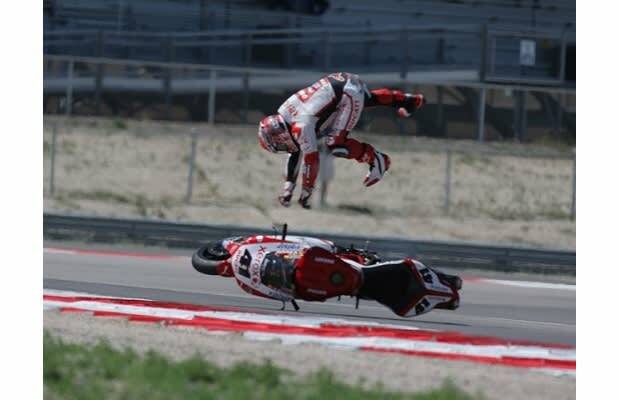 Complex Says: Noriyuki Haga, or “Nitro Nori” to some, crashed recently during practice at Salt Lake City. X-rays revealed that he broke his collarbone in three places. But he insisted that with the help of painkillers, he could not only compete in Superpole, but also run both races the next day. He got his wish, and did all of the above before reporting for surgery to install a plate to hold his collarbone together. To prove his fitness for the race, he did pushups with his broken collarbone. Oh, and after breaking his collarbone in the first place? He managed to ride his bike back in to the pits. In 2009, Haga suffered a broken scapula and displaced fracture of the left wrist that required surgery. Doctors initially thought he'd also fractured two vertebrae in his spine, and would need further surgery. Later, they realized those vertebral fractures were from an EARLIER accident, and didn't need surgery after all. What did Haga do as soon as he possibly could? Get back on his bike. We could go on, but we've got other people to add to this list.